Allow me to post in a personal sense for posterity. I am not a person that allows much room for heroes. I have a few – Jefferson, Orwell, Keith Richards – but most of my heroes played in royal blue. And they are personal heroes. I started supporting Everton Football Club in the early 1960’s for no other reason than they played in blue, my favourite colour, and also that their players tended to have comic-book names. I got caught up with it and am changed forever, despite my better nature. I first saw Everton in 1967, at an away game in my then local city of Nottingham. But at the tender age of thirteen I started going to home games which were over a hundred miles away from my home. My first Everton game at Goodison Park was a 2-1 victory over Sheffield Wednesday in 1969. We went on to win the league that season. And therefore the team of team of 1969-70 has remained special to me. From memory, Everton used only fifteen players in that whole season. Nowadays every team has at least fourteen starters or substitutes. Sandy Brown and Tommy Jackson came from Scotland and Northern Ireland respectively, but didn’t figure much that season – apart from Brown’s spectacular own goal for Liverpool. Remarkably given the state of today’s Premier League, of the remaining thirteen, eight, no less, were born within the city limits of Liverpool. The remaining five were all from Northern England – not a player south of the Trent among them all. Gordon West was one these five, hailing from Barnsley in Yorkshire. Nevertheless, he came to Everton in 1962 and stayed for ten years, winning the league twice and the FA Cup once. He was the best goalkeeper in England by 1970, but elected not to go to Mexico in that year, preferring to spend time with his family. He did play for Tranmere after that, but was seen at Goodison as a fan for many years. The last time I saw Gordon West was at a pitch-side remembrance for his former colleague and Evertonian Brian Labone. I recall thinking that I didn’t remember him as that big. But he was a giant for Evertonians of my vintage. I confess that I am truly upset that Gordon West died, after a long illness, on Monday June 10. This is the previous post, initially. As usual I get sidetracked, which is one reason why I suspect that I won’t ever be any good at this. Anyway, it should be clear that I love football. And football is culturally significant, at least to a large minority of us. Football feeds on and nourishes culture, as I’ve just said below. And therefore what happens in football is important as a means of describing our lives and attitudes – equally our lives and attitudes determine our attitude towards football. Substitute rugby union, or basketball or some other sport, religion, ideology, what you will – the context is the same. I do like other sports a lot, golf, tennis, cycling and American football in particular. I wish I was good at any one of them. However, none come close to football, and I attribute its cultural context to this. Other cultures operate in different contexts. We are told, for example, that one reason that football hasn’t taken off in the US is that (cup games apart), the Americans can’t take the prospect of a draw, or tie, as a valid result. We therefore have the ludicrous (to me) idea of “overtime” in what is essentially a league game when scores are tied. We’re told that Americans can’t abide the idea of a sporting contest that doesn’t produce a winner. For this reason the world’s second most popular sport – cricket – will never take off in the US, as the thought of five days play without a result is too much to bear. It should be said that I was mildly devastated, again, that the New Orleans Saints couldn’t make it all the way this year, despite once again having the best offence in the NFL. It’s true that I’ve told virtually nobody about this blog. For now I’m content with that, and I’m writing mostly for myself. The intention is, however, to make it a feast of faith, philosophy and football, with a few music videos thrown in as filler. Some quite shocking news this week. In France a gunman, over the last nine days, has killed seven people – three soldiers of North African or Caribbean origin and yesterday (March 19) a religious teacher and three children. Another teenager, shot in the same incident, is gravely ill. Whether the perpetrator(s) is an extremist right-wing, racist, anti-Semitic or something else is not much more than speculation at the moment. Hopefully he will have left enough clues to ensure his quick capture. Yesterday (March 14) marked a significant anniversary in the history of Everton Football Club. It was ten years to the day that David Moyes was appointed manager. Only Alex Ferguson and Arsene Wenger, of all current managers in the Football League, have kept their jobs longer. It’s well-known that being a top manager is one of life’s more precarious existences, and becoming more so. Hereford United recently sacked their manager, and that meant that more than half of the top 92 English clubs have changed this season alone. While Ferguson and Wenger have also been the most successful managers over that period – and therefore there’s a lot to be said for continuity – the general lack of longevity makes Moyes’ achievement all the more remarkable. Ten years earlier in 1992, of course, Everton were one of the “Big 5”, having won two of the previous five championships. But of these clubs, Everton, through a failure to anticipate media-led changes and act accordingly, had fallen from their elevated position and by 2002 expectations were lower. This has helped Moyes undoubtedly, as his reputation rests in the main on his teams punching above their weight. Another thing in his favour is his relationship with Chairman “Blue Bill” Kenwright. Kenwright is rich by any standard except of that required for megalomaniac Premier football club owners, and would, I gather, love to sell the club to one of these people so that Everton can once again compete right at the top without having to make silk purses from sows’ ears. But Blue Bill, if nothing else, has the best interests of the club at heart and won’t just sell to anybody. It’s a hard sell, anyway, as the antiquated Goodison Park is a major millstone. But Blue Bill has invariably kept faith with his managers – Walter Smith, who constantly bought badly for too much then played his team in wrong positions, stayed far, far too long. In the case of Moyes, this faith has clearly been for the better, despite not yet winning any silverware at all. (Although to be fair, I was at the game against Manchester United in 2004 where my namesake, Big Dunc, scored the 85th minute goal that virtually assured us of Champions League qualification, and it was just like winning the league). Net spending on players has not been that bad – Everton rank 11th since the start of the Premier league, although only a tenth of that of Chelsea or Manchester City, this is about the same as Stoke, Bolton and Wolves, and about half that of Fulham, Newcastle or Sunderland. Clearly, performance has exceeded all of those clubs, not to mention that in the last ten years they’ve had an average of six managers each, and Newcastle have had eleven, plus caretakers. It’s only in the last three years, since the signing of Fellaini, that belt-tightening has taken over with a vengeance, though. Moyes hasn’t got everything right by any means – Kroldrup, Beattie, van der Meyde (?!?) – and why he brought McFadden back is a mystery to me, but seems to have a talent for acquiring players thought just below the highest level and getting them to achieve that status, such as Cahill, Jagielka, Baines, Lescott, Arteta. I’m also not sure what striker best fits Moyes’ system, or even if there is such a thing. Hopefully Jelavic will prove me wrong, but apart from a short period of form from Andy Johnson, all Everton strikers since 2002 have ultimately been failures. And it seems that lack of goals have been Moyes’ and Everton’s biggest problem right through the last ten years. Who knows what would have happened had Rooney stayed? Having said that, it makes Moyes’ achievements with the rest of his system even more meritorious. With more prolific goalscorers Everton would surely be a European fixture and his reputation would be even higher. He obviously has many managerial talents, as this BBC appraisal shows. But I would say his best quality is his determination to approach the game in an honest manner. We saw this only this week, after the disastrous result at Anfield, where he clearly accepted the score as a result of Everton’s own errors. In an occupation noted for excuses, Moyes’ approach has always been refreshing. Every time one of the “big clubs” has a vacancy, Moyes’ name is in the frame – for good reason. It’s said that he’ll be off to Tottenham in the summer if Harry Redknapp takes the poisoned chalice that is England. I have my doubts that that will happen but the pressure on Moyes to cement his reputation with one of these clubs won’t diminish. I’m not sure what would happen should Tottenham or some other club with money to burn come in for him – there was talk of him going to Newcastle a little while ago, but that was never going to happen, as they’re not as big as they think they are. But I would like to think that he realises how fortunate he’s been, alongside his obvious talent. Everton have been steadfastly loyal to Moyes and he’s repaid it. Long may he continue to do so. Here’s to the next ten years! I did hope that it wouldn’t be March before I got round to this post, but to no avail. Anyway, after a 4600-word post I’ll try to imbue this one with a little conciseness. February was a good month for my two favourite subjects – football and religion. The greatest-ever philosopher? It can’t be Plato or Aristotle because they never played for Brazil. 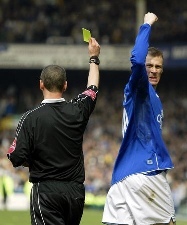 It’s been a bad week for football, with the passing of ex-Evertonian Gary Speed. Now comes, if anything, even worse news. The Brazil team of 1982 was, in my humble opinion, the best of all the sides from that country. Again, they never won anything, but took part in arguably the greatest-ever World Cup match in Spain that year, losing to an inspired Italy. 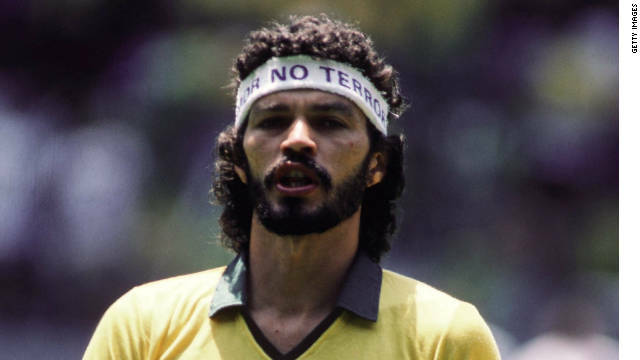 That had some great players but none, not even Zico, as great as Socrates Brasileiro Sampaio de Sousa Vieira de Oliveira, known as Socrates for short. He wasn’t your typical Brazilian footballer. He was as near to being an intellectual as any player, before or since. He delayed his professional career to qualify as a medical doctor, was at the forefront of democratic protest against the Brazilian junta at the time, was a well-known journalist and commentator and gained a Ph.D in philosophy. On the field it showed. He is recorded as saying that he played to his weaknesses but you would never know. A towering yet elegant presence, few ever read the game as well as he did, few had his eye for a defence-splitting pass, and very few showed such leadership. He will be missed. I confess I have no idea how the regular bloggers find the time to produce so much. How, for example, does Eric McDonald manage to produce a lengthy, comprehensive, articulate, high quality and well thought out post almost every day? There are loads of things that I feel I could say, but I just don’t have the time, and by the time I could get round to it the moment has passed. Of course that could be an organisation problem on my part. I do have to admire the likes of Eric and Jerry Coyne, who has a full-time job as well to contend with. Anyway I do intend this to be my first post apart from the introduction and I always intended to make it one about football, important in so many ways. I get the feeling that it will go nowhere but I would like to pay some homage to major football history. We all know of events after which nothing is quite the same. Parenthood, for one thing, is something that most anyone who has children will recognise as such an event. But it could be first hearing a different type of music, or reading a book, seeing a movie, finding religion or abandoning it. Or, in this case, watching a football match. I’ve recently returned from the Caribbean and as usual a great time was had by all. There was a tinge of sadness, however, as it was probably the last time we’ll spend on holiday with both our boys. But to the matter in hand. Many years ago I bought a book about football in Holland – Brilliant Orange: The Neurotic Genius of Dutch Football by David Winner. I was thinking about this book because one son read it during our holiday and now it’s in the possession of the other – for a while, I’m missing an old friend. Football, arguably more than any other activity including religion, is a cultural phenomenon – even the anti-football culture of many Americans attests to this. As such, it’s a vehicle for deeper anthropological and cultural understanding. The best football books, such as the outstanding Football Against the Enemy by Simon Kuper, make this clear. A lot can be understood about a country or region’s culture by studying its football (or lack of it).